"Overtones" redirects here. For other uses, see Overtones (disambiguation). Vibrational modes of an ideal string, dividing the string length into integer divisions, producing harmonic partials f, 2f, 3f, 4f, etc. (where f means fundamental frequency). An overtone is any frequency greater than the fundamental frequency of a sound. Using the model of Fourier analysis, the fundamental and the overtones together are called partials. Harmonics, or more precisely, harmonic partials, are partials whose frequencies are numerical integer multiples of the fundamental (including the fundamental, which is 1 times itself). These overlapping terms are variously used when discussing the acoustic behavior of musical instruments. (See etymology below.) The model of Fourier analysis provides for the inclusion of inharmonic partials, which are partials whose frequencies are not whole-number ratios of the fundamental (such as 1.1 or 2.14179). When a resonant system such as a blown pipe or plucked string is excited, a number of overtones may be produced along with the fundamental tone. In simple cases, such as for most musical instruments, the frequencies of these tones are the same as (or close to) the harmonics. Examples of exceptions include the circular drum, – a timpani whose first overtone is about 1.6 times its fundamental resonance frequency, gongs and cymbals, and brass instruments. The human vocal tract is able to produce highly variable amplitudes of the overtones, called formants, which define different vowels. 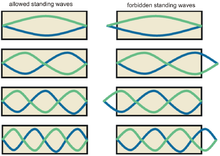 Most oscillators, from a plucked guitar string to a flute that is blown, will naturally vibrate at a series of distinct frequencies known as normal modes. The lowest normal mode frequency is known as the fundamental frequency, while the higher frequencies are called overtones. Often, when an oscillator is excited — for example, by plucking a guitar string — it will oscillate at several of its modal frequencies at the same time. So when a note is played, this gives the sensation of hearing other frequencies (overtones) above the lowest frequency (the fundamental). Timbre is the quality that gives the listener the ability to distinguish between the sound of different instruments. The timbre of an instrument is determined by which overtones it emphasizes. That is to say, the relative volumes of these overtones to each other determines the specific "flavor", "color" or "tone" of sound of that family of instruments. The intensity of each of these overtones is rarely constant for the duration of a note. Over time, different overtones may decay at different rates, causing the relative intensity of each overtone to rise or fall independent of the overall volume of the sound. A carefully trained ear can hear these changes even in a single note. This is why the timbre of a note may be perceived differently when played staccato or legato. A driven non-linear oscillator, such as the vocal folds, a blown wind instrument, or a bowed violin string (but not a struck guitar string or bell) will oscillate in a periodic, non-sinusoidal manner. This generates the impression of sound at integer multiple frequencies of the fundamental known as harmonics, or more precisely, harmonic partials. For most string instruments and other long and thin instruments such as a bassoon, the first few overtones are quite close to integer multiples of the fundamental frequency, producing an approximation to a harmonic series. Thus, in music, overtones are often called harmonics. Depending upon how the string is plucked or bowed, different overtones can be emphasized. Consider a guitar string. Its idealized 1st overtone would be exactly twice its fundamental if its length were shortened by ½, perhaps by lightly pressing a guitar string at the 12th fret; however, if a vibrating string is examined, it will be seen that the string does not vibrate flush to the bridge and nut, but it instead has a small “dead length” of string at each end. This dead length actually varies from string to string, being more pronounced with thicker and/or stiffer strings. This means that halving the physical string length does not halve the actual string vibration length, and, hence, the overtones will not be exact multiples of a fundamental frequency. The effect is so pronounced that properly set up guitars will angle the bridge such that the thinner strings will progressively have a length up to few millimeters shorter than the thicker strings. Not doing so would result in inharmonious chords made up of two or more strings. Similar considerations apply to tube instruments. Physical representation of third (O3) and fifth (O5) overtones of a cylindrical pipe closed at one end. F is the fundamental frequency; the third overtone is the third harmonic, 3F, and the fifth overtone is the fifth harmonic, 5F for such a pipe, which is a good model for a panflute. An overtone is a partial (a "partial wave" or "constituent frequency") that can be either a harmonic partial (a harmonic) other than the fundamental, or an inharmonic partial. A harmonic frequency is an integer multiple of the fundamental frequency. An inharmonic frequency is a non-integer multiple of a fundamental frequency. Some musical instruments produce overtones that are slightly sharper or flatter than true harmonics. The sharpness or flatness of their overtones is one of the elements that contributes to their unique sound. Due to phase inconsistencies between the fundamental and the partial harmonic, this also has the effect of making their waveforms not perfectly periodic. Musical instruments that can create notes of any desired duration and definite pitch have harmonic partials. A tuning fork, provided it is sounded with a mallet (or equivalent) that is reasonably soft, has a tone that consists very nearly of the fundamental, alone; it has a sinusoidal waveform. Nevertheless, music consisting of pure sinusoids was found to be unsatisfactory in the early 20th century. In Hermann von Helmholtz's classic "On The Sensations Of Tone" he used the German "Obertöne" which was actually a contraction of "Oberpartialtöne", or in English: "upper partial tones". According to Alexander Ellis (in pages 24–25 of his definitive English translation of Helmholtz), the similarity of German "ober" to English "over" caused a Prof. Tyndall to mistranslate Helmholtz' term, thus creating "overtone". Ellis disparages the term "overtone" for its awkward implications. Because "overtone" makes the upper partials seem like such a distinct phenomena, it leads to the mathematical problem described above where the first overtone is the second partial. Also, unlike discussion of "partials", the word "overtone" has connotations that have led people to wonder about the presence of "undertones" (a term sometimes confused with "difference tones" but also used in speculation about a hypothetical "undertone series"). In barbershop music, a style of four-part singing, the word overtone is often used in a related but particular manner. It refers to a psychoacoustic effect in which a listener hears an audible pitch that is higher than, and different from, the fundamentals of the four pitches being sung by the quartet. The barbershop singer's "overtone" is created by the interactions of the upper partial tones in each singer's note (and by sum and difference frequencies created by nonlinear interactions within the ear). Similar effects can be found in other a cappella polyphonic music such as the music of the Republic of Georgia and the Sardinian cantu a tenore. Overtones are naturally highlighted when singing in a particularly resonant space, such as a church; one theory of the development of polyphony in Europe holds that singers of Gregorian chant, originally monophonic, began to hear the overtones of their monophonic song and to imitate these pitches - with the fifth, octave, and major third being the loudest vocal overtones, it is one explanation of the development of the triad and the idea of consonance in music. Playing a harmonic on a string. Here, "+7" indicates that the string is held down at the position for raising the pitch by 7 half notes, that is, at the seventh fret for a fretted instrument. String instruments can also produce multiphonic tones when strings are divided in two pieces or the sound is somehow distorted. The Sitar has sympathetic strings which help to bring out the overtones while one is playing. The overtones are also highly important in the tanpura, the drone instrument in traditional North and South Indian music, in which loose strings tuned at octaves and fifths are plucked and designed to buzz to create sympathetic resonance and highlight the cascading sound of the overtones. Western string instruments, such as the violin, may be played close to the bridge (a technique called "sul ponticello" or "am Steg") which causes the note to split into overtones while attaining a distinctive glassy, metallic sound. Various techniques of bow pressure may also be used to bring out the overtones, as well as using string nodes to produce natural harmonics. On violin family instruments, overtones can be played with the bow or by plucking. Scores and parts for Western violin family instruments indicate where the performer is to play harmonics. The most well-known technique on a guitar is playing flageolet tones or using distortion effects. The Ancient Chinese instrument the Guqin contains a scale based on the knotted positions of overtones. Also the Vietnamese Đàn bầu functions on flageolet tones. Other multiphonic extended techniques used are prepared piano, prepared guitar and 3rd bridge. Wind instruments manipulate the overtone series significantly in the normal production of sound, but various playing techniques may be used to produce multiphonics which bring out the overtones of the instrument. On many woodwind instruments, alternate fingerings are used. "Overblowing", or adding intensely exaggerated air pressure, can also cause notes to split into their overtones. In brass instruments, multiphonics may be produced by singing into the instrument while playing a note at the same time, causing the two pitches to interact - if the sung pitch is at specific harmonic intervals with the played pitch, the two sounds will blend and produce additional notes by the phenomenon of sum and difference tones. Non-western wind instruments also exploit overtones in playing, and some may highlight the overtone sound exceptionally. Instruments like the didgeridoo are highly dependent on the interaction and manipulation of overtones achieved by the performer changing their mouth shape while playing, or singing and playing simultaneously. Likewise, when playing a harmonica or pitch pipe, one may alter the shape of their mouth to amplify specific overtones. Though not a wind instrument, a similar technique is used for playing the jaw harp: the performer amplifies the instrument's overtones by changing the shape, and therefore the resonance, of their vocal tract. Overtone singing, also called harmonic singing, occurs when the singer amplifies voluntarily two overtones in the sequence available given the fundamental tone they are singing. Overtone singing is a traditional form of singing in many parts of the Himalayas and Altay; Tibetans, Mongols and Tuvans are known for their overtone singing. In these contexts it is often referred to as throat singing or khoomei, though it should not be confused with Inuit throat singing, which is produced by different means. ^ a b Alexander J. Ellis (translating Hermann Helmholtz): On the Sensations of Tone as a Physiological Basis for the Theory of Music, pages 24 and 25. 1885, reprinted by Dover Publications, Inc., New York, 1954. ^ Riemann by Shedlock (1876). Dictionary of Music. Augener & Co., London. p. 143. let it be understood, the second overtone is not the third tone of the series, but the second. Look up overtone in Wiktionary, the free dictionary.